“Can you design for us a house that has no straight walls?” began our interview to become the architects for this unexpected commission. A young cosmopolitan couple living in Europe and with the resources to plan for the future was looking to build a house along the Intracoastal Waterway. It would be used only for holidays until their teenage children were on their own. But the parents made it clear from the start that this would always be a “play house”, nothing about it needed to be formal. This was intended to be a welcoming family destination for years to come, able to comfortably shelter multiple generations looking forward to spending time together. The multi-acre site consisted of two flat levels separated by a 10’ slope. This unnatural configuration resulted from the site of the previous house built in the 1940’s, torn down 50 years later. A single yellow flowering tabebuia tree remained from the original landscaping. Learning of its rare existence we decided to allow its location to define the layout of the house. Basically we built the house around the tree. A series of pavilions are connected to a ribbon shaped hallway curving around the branches of the tree. Each pavilion houses a specific program: sleeping, living, dining etc. Unique roof shapes define each of the pavilions as well. There is a daytime side of the house where the rooms look out to the river. 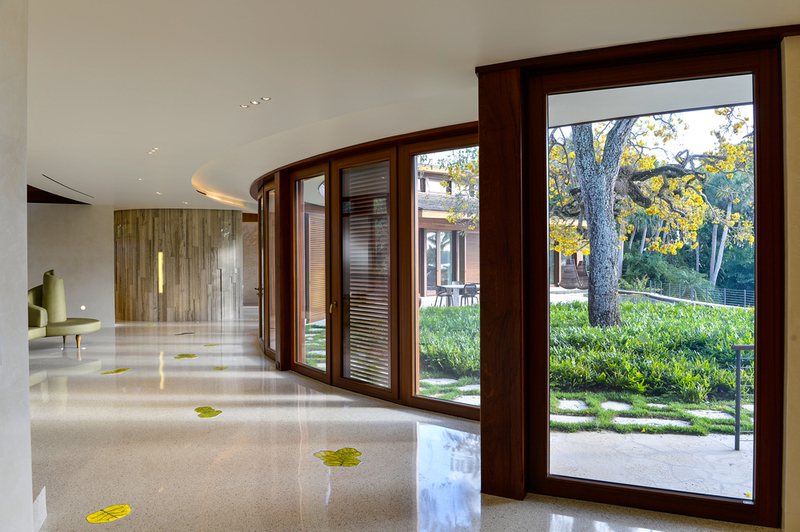 On the opposite end of the house is the nighttime room where a 100-year-old ficus tree is the focus visible through the curving glass facade.